Throughout history, brides have worn a spectrum of colors on their wedding day. From rich and bold brocades to practical neutral hues, a bride's dress was generally crafted with the intention of being worn again. It wasn't until Queen Victoria wore white in her 1840 wedding to Prince Albert, that the color became de rigueur for wedding gowns. This fall, Vera Wang enraptured the fashion world with her Spring 2012 collection of black bridal gowns. 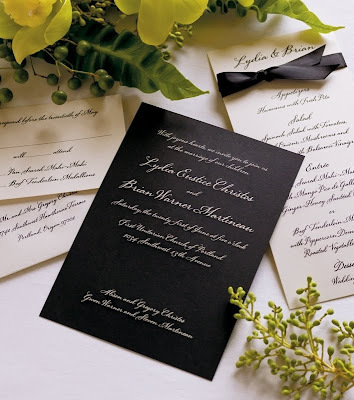 The same drama and romance is reflected on paper with our new Vera Wang Black Engraved Wedding Invitation. 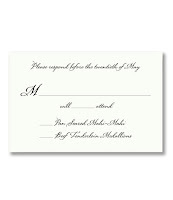 Gorgeously engraved in a proprietary calligraphic font, this invitation marries boldness with sophistication. It is a strong statement yet impressively timeless.